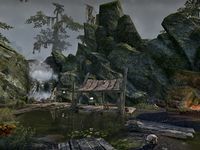 Weeping Wamasu Falls are located in western Shadowfen, north of White Rose Prison. The falls are home to a special crafting site, where you may craft items in the Whitestrake's Retribution set. Fenwalker's Post, a guild kiosk run by Junal-Nakal, resides here. This page was last modified on 28 March 2019, at 01:45.